This week in the Windy City, Mazda revealed the much-anticipated MX-5 Miata 30th Anniversary Edition, and we were not disappointed. 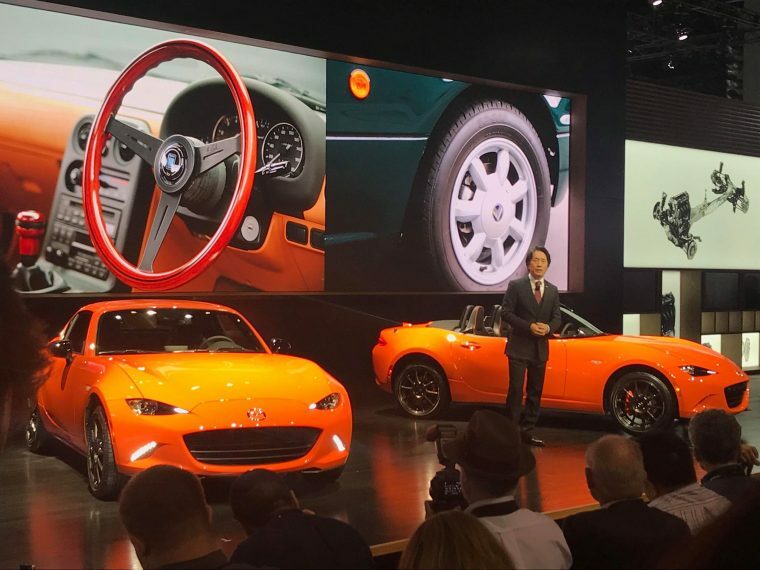 Masahiro Moro, president and CEO of Mazda North American Operations, was proud to head Mazda’s conference at the 2019 Chicago Auto Show where the special edition of the Miata was announced. And boy, did it pay off. The most striking detail about the Miata is the custom paint color made for the 30th Anniversary edition: a vibrant Racing Orange which took a cue from the yellow MX-5 Miata Club Racer revealed at CAS back in 1989. The Miata boasts curvy zigzag daytime running LEDs and sharp rhombus headlights. The lightweight roadster pumps out 181 horsepower and a 7,500 rpm redline while remaining compliant with emissions and boasting the quality safety standards you’d expect from Mazda. This special 30th Anniversary Edition is available in soft-top convertible and hard-top RF versions, and you have the choice between an automatic transmission and a six-speed manual with limited slip differential and Bilstein dampers. The 30th Edition Miata sports exclusive RAYS Co., Ltd. Forged aluminum wheels in dark gunmetal paint, based on Global MX-5 Cup race wheels. During the reveal, you could spot bright orange brake calipers to match the unique paint color. Some other finishes match the distinctive Racing Orange color like the stitching and piping on the RECARO seats, which is offset by Piano Black accents and leather trim to create traditional roadster appeal. The estimated arrival date for the 30th Anniversary Miata is June of this year with a starting MSRP of $34,995. Only 3,000 units will be produced, and 500 of those will be sold in the U.S. market. The News Wheel is live tweeting, Instagramming, Facebooking, and more from the 2019 Chicago Auto Show. Follow The News Wheel on social media to stay up-to-date on all things CAS 2019 and perhaps catch a closer look at the vibrant Miata 30th Anniversary Edition.